Fragrant and crispy chicken wings – a real treat. 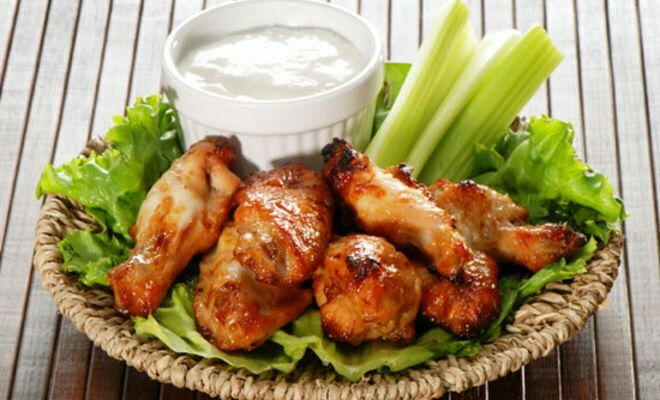 They are prepared quickly, and the secret is in the marinade, which gives the wings an unusual spicy flavor. - 700 g of chicken wings. First of all, peel and chop with a knife or in a blender onions. Then mix soy sauce with ketchup and add the chopped onions. All components mix well and pour over chicken wings cooked marinade. Since the soy sauce contains enough salt, optional salt marinade is not necessary. Place a bowl of marinated wings in a cool place for an hour. Then place them on a baking sheet and bake for half an hour in the oven, preheated to 180oC. - 1 kg chicken wings. Mix soy sauce with honey. For the marinade, you should take liquid honey, if he candied, it must be melted in a water bath. Add the remaining ingredients: vegetable oil, ground ginger and pepper, and peeled and crushed garlic. Mix well. Make sure the honey is fully dissolved. Well then grate the washed and dried chicken wings with marinade and place them at 3 hours in the refrigerator, and if possible, leave overnight. Then fry chicken wings in a pan in vegetable oil. Then cover them with the remaining marinade, and place for 10 minutes in a preheated 180 ° C oven. - 500 g chicken wings. Garlic cloves peel and chop with a knife or skip through the press. Mix tomato paste with ketchup, season to taste with salt, pepper and add the chopped garlic. Prepared chicken wings (washed and dried) put in a deep bowl, pour the prepared tomato marinade and put for 3-4 hours or overnight in a cool place. Pickled in this way the wings are cooked in the oven very quickly, in just 15 minutes. Peel and crush the garlic cloves. Dill and Basil have a good wash, dry and finely chop. Then mix the tomato paste with paprika, ground ginger, black pepper, garlic, dill and Basil. Mix well and coat chicken wings cooked marinade. Then place them in a cold place, and after that time, add salt and bake in the oven or on the grill.